Ring Resizing has multiple factors that determine if and how much a ring can be resized, and the most common factor is the actual design/style. All rings are not created equal when it comes to how many sizes they can be sized up or down. Some are very basic and can be sized up or down 2-3 sizes. Others have very intricate designs which limit the amount it can be sized, or if it can be sized at all. A basic metal ring or band can usually be sized quite easily if there is ample metal and it is not hollow. There are many different setting types, and some settings are easier to size than others. An important factor to consider is the number of stones, and how closely they are set to the ring sizing area at the back of the shank. •	Prong Set Stones – Stones set in a ring with prongs can easily be sized since the stones are set above the metal held by prongs. If a stone loosens during the sizing process, it can easily be tightened. •	Channel Set & Pave Set Stones – These stones are set down in the metal that is manipulated during the sizing process, therefore they can become loose, crack, chip, or fall out of the setting during the sizing process. This factor limits the amount that a ring can be sized. •	Invisible Set Stones – These stones are set side-by-side, which hides the metal work underneath, and can give the appearance of a larger stone. The stones are supported by the metal work as well as each other. This intricate setting style has very limited sizing opportunity, and must be performed by a highly-trained master jeweler. A ring with a pattern that goes all the way around the shank usually cannot be resized because the sizing process will remove or damage the pattern in the area where the work is performed. The ring can be sized if you do not mind a smooth/no pattern area on the back of the shank. Some rings with a patterned shank have an area at the back without the pattern for sizing purposes. This is referred to as a sizing bar. A ring that is made more than one metal type may not be able to be sized. For example: 18K Yellow Gold and Platinum have a very different melting point which makes it impossible to solder or apply heat. Some metals cannot be sized: Titanium, Stainless Steel, and Tungsten. •	Stabilizing Beads – Beads made of the same metal as the ring can be soldered inside the shank to prevent a top-heavy ring or a ring with a tendency to spin on your finger from spinning. •	Ring Guards – A guard made of the same metal as the ring can be soldered on the inside of the shank to make the ring smaller. This is usually used if a ring cannot be sized down far enough to fit the finger using traditional sizing methods. •	Spring Shanks – A flexible piece of metal that is soldered on the inside of the shank to make the ring fit smaller. This is usually used when a person has a larger knuckle. The metal flexes out to go over the knuckle and then flexes back for a tighter fit and prevent it spinning when worn. •	Arthritic Shanks – A design that allows the ring shank to open and close. This is used when a customer has a significant size difference between the knuckle and the finger. There are several different styles of arthritic shanks. They usually require full shank replacement (replace the existing shank with the arthritic shank). Again, there are many factors that determine if and how much a ring can be sized, and MyJewelryRepair.com has the highly-trained master jewelers to perform the work and provide guidance on the ring sizing process, if needed. 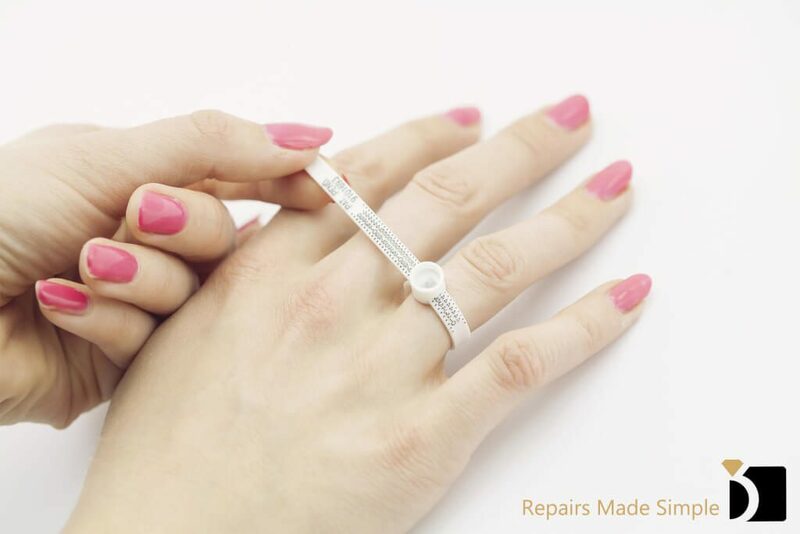 For more information about our Ring Repair and Sizing Services, please click Here.